Sweet Jude, a rainbow baby for his loving parents made his arrival into the world after a long labor and eventual c-section. When Judah's parents recount his birth to him in the future, I think they will tell him about the many people who supported them in their journey. Family, friends, Midwives, Doctors, Nurses and their Doula and Doula-in training. They might laugh and tell how they only found out that the C-section was moved earlier when they woke in the wee hours to the surprise of their doctor standing over them in the darkened room letting them know of the time change. They may even say how their birth photographer ended up with her first photo radar ticket on her way to a birth. 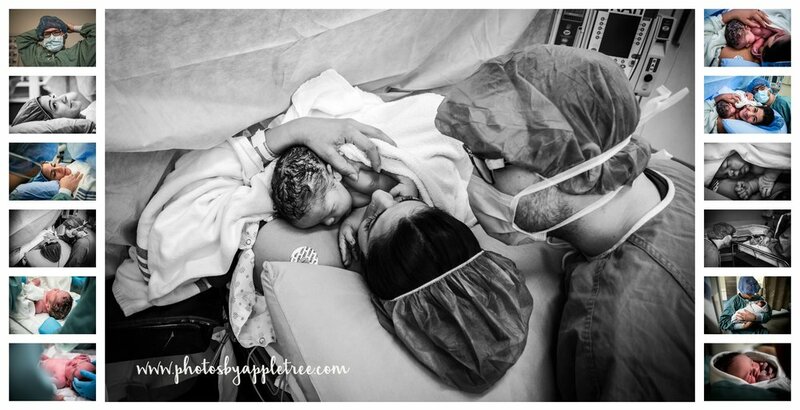 After finding out about the OR time change and knowing how important it was to Jude's momma to have his birth captured. (Disclaimer: My foot was only a wee bit heavy, and the streets were empty). I know they will tell of the love surrounding this wee boy as he was welcomed by the many excited visitors in his first hours and days. Over everything else, I know they will share their love and excitement with him as they view the photos and slideshow of his birth-day. Over and over again my families tell me the same thing, with the heightened emotions and adrenaline surrounding a birth the memories of a birth-day may fade. Birth itself has a natural amnesia effect on many women. So when I reveal their slideshows and galleries after they have had time to process their story personally first. They often remark on how they almost forgot some details or they didn't notice a moment that they are so happy to now see. Moms and Dads both tell me how glad they are to have their story captured so they can remember all of the little moments no matter how much time has passed.